finally some nail polish pictures!!! 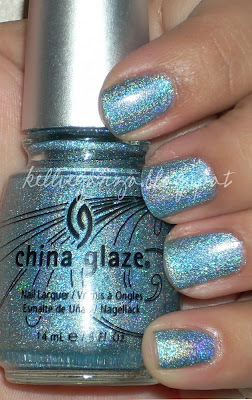 here is my first kaleidoscope from china glaze, kaleidoscope him out. lovely light blue holo. i'm flabbergasted that this collection is discontinued. it's positively orgasmic. polish-gasmic. (excuse my french, miss manners) i did not get the drag i expected from this collection, à la the OMG collection problem-o's (at least for me). great application. and i loved this so much i wore it for three straight days!! zomg. 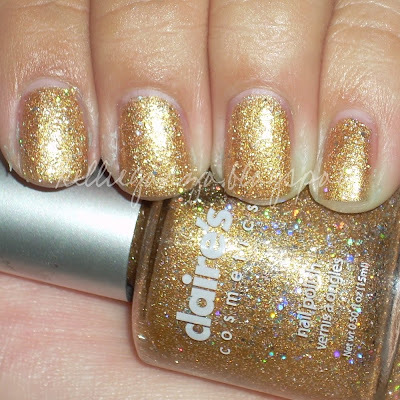 the next one is claire's goldmine, a gold polish with crystaly flecks and holo glitter. la la loved it! fun and slightly less blingy than expected on the nail, but it's cool cuz sometimes understated is the statement you want to make, am i right? super duper easy to apply also. this is three coats. a bit rough to the touch, but a few thick coats of topcoat should take care of that if it bothers you. i wore this mani for two days! school is really taking a toll on my polish changing habits... and a kelliegonzo classic in the making essie cantaloupe, which i think i've heard is discontinued but i was able to get from transdesign. i heard about it from a fellow blogger (i can't recall who, sorry!) and i can see why it is a must have. great pinky melon color, perfect for any occasion. great essie formula, went on like butter. two coats i believe.